Dessert tables at parties have been all the rage the last several years (I blame Amy Atlas for blowing them up!) 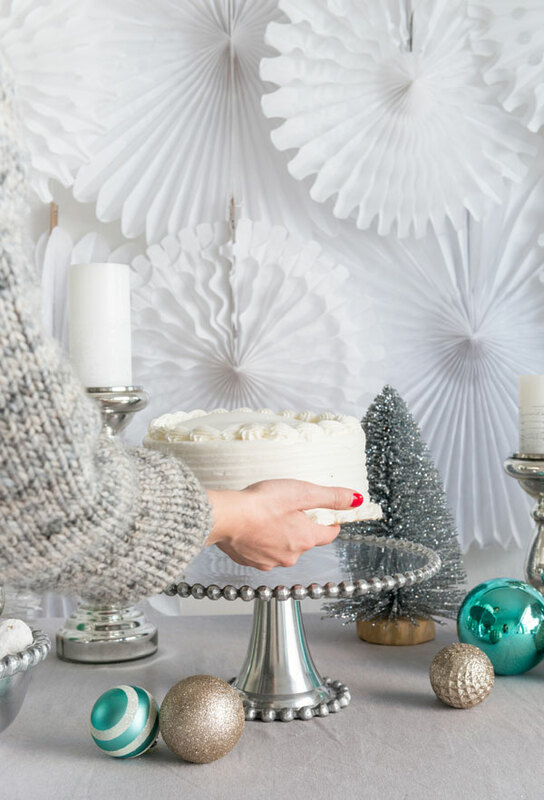 I love dessert tables but they can be tricky to get just right. If you aren’t careful they can end up looking a little sad. The first one I ever made I spent a lot of time and effort and the table came out looking flat and sparse. 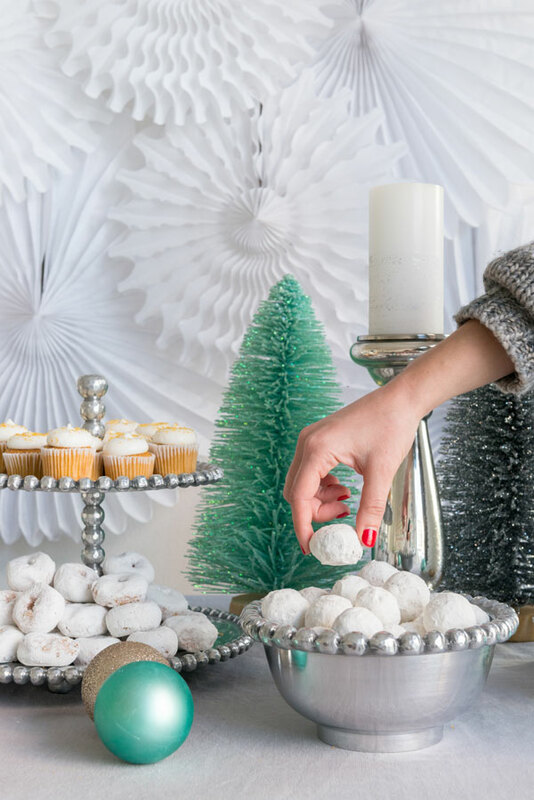 I eventually figured out the trick and today I’m going to give you my favorite tips for a successful dessert table. Step 1: Hang a backdrop. For this dessert table we hung up white honeycomb decorations in different sizes. They look like snowflakes! 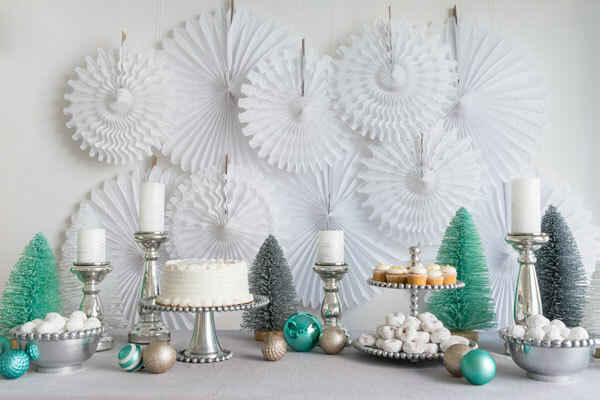 See more backdrop ideas here. 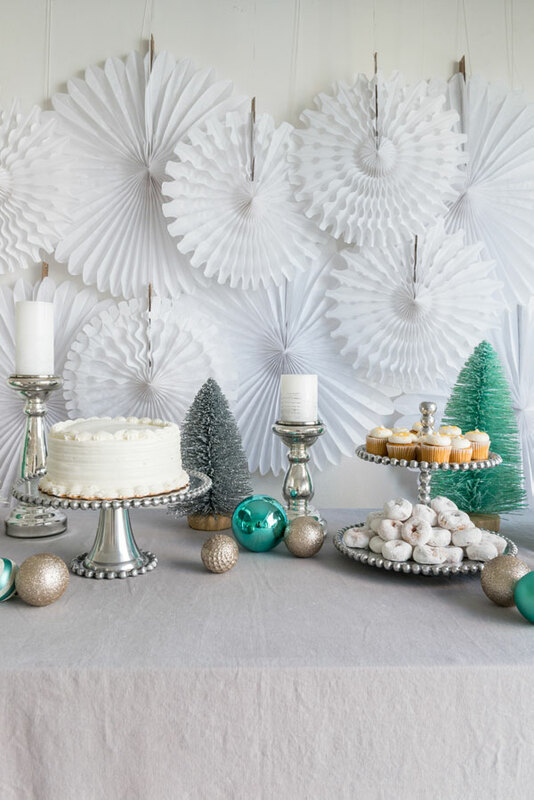 You can add height through a backdrop or even hang a banner or wallpaper behind the table. This is key! Step 2: Add a Landscape. The next important step is to get serving platters in various heights. Cakeplates, Bowls, Trays, etc. I’ve even turned a nice box lid from a gift as a platform for a serving tray to give it a little extra boost. Arrange the serving platters and candlesticks in varying heights across the table. Again, the varying heights is super important. Step 3: Decorate. Add candles and extra items that fit the theme of your party. For this table, we arranged miniature trees, ornaments, and candlesticks. We love the candlesticks because they are so tall and the trees add lots of heights and layers to the table. Step 4: Set out the food. Last step! We chose white desserts to keep with our theme (cupcakes, cake, powdered donuts, etc) Et voila! You’ve got a pretty and special dessert table. Love this! I want to try this with Moroccan pottery stands. Thank you! How did you know I needed this tutorial? My roommate and I throw a kitschy Christmas party every year and we always like to WOW our guests with a nice spread of sweets. Thanks for the tips – we will definitely be stopping by Target. This is awesome! Can’t wait to try this out!! I love the colour scheme of this dessert table! These are very helpful and inspiring tips! oh my gosh, so gorgeous! I love it! I loooove bottlebrush trees. Definitely going to have to use them in my Christmas decorating this year. 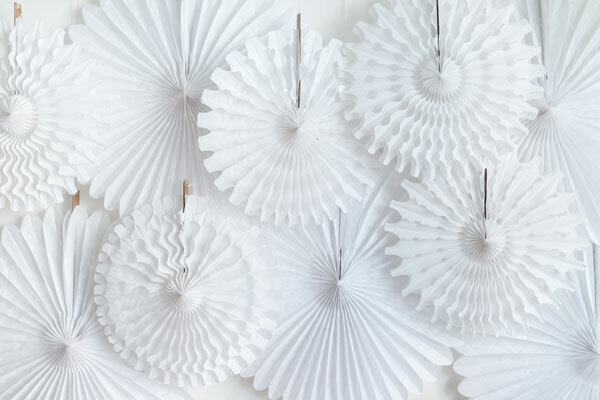 For my wedding, which was more open-concept, we hung pom poms from the ceiling at varying heights to create a backdrop. Amazing! I love dessert tables! 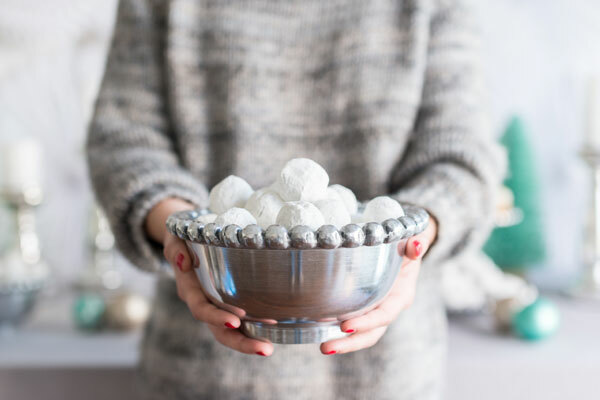 This looks so festive and oh so perfect for Christmas! Wow, that’s pretty! Too bad we’re in the process of packing up our home and moving. All my “stuff” is sitting in the dark in a storage unit. (Arg) But I’ll bookmark these great ideas for when we’re settled. Love this helpful tutorial! I can’t wait to make my next dessert table. 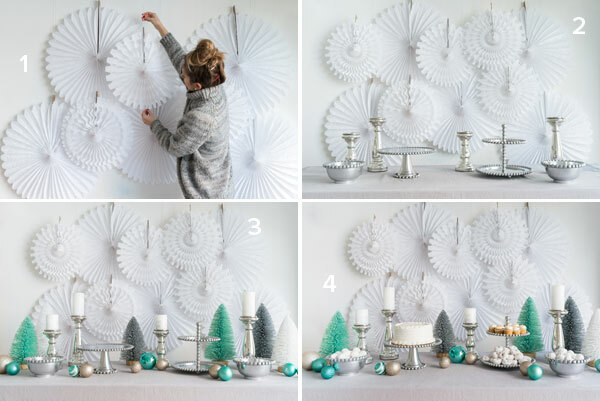 One question: how do you hang things for the backdrop without making it look ugly? Washi tape? Clear tape? @Erin, I’ve also set up dessert tables in an open background situation by using garlands or tissue paper fringe strung between two wooden dowels. I anchor the dowels in tin cans full of beans (or something similar), that I’ve wrapped with paper or fabric to look cute. You might need to do a few to get the entire stretch of a long table, but it’d work. Beautiful styling. I would love to wow my friends with this tasty setup. This IS a beautiful setting, but because of all the snow we already have here (we had our first snow–it has stuck around–on Oct. 25, 2014), plus the hospital I work in has a LOT of white walls, we’d be using cheerful, warming colors. Some of the nurses, for things such as Nurses Week, tape hanging things to the huge windows in our ICU break room, and then put down disposable coordinated table covers. Again, because of all the white around us, we all tend to use bright colors, or at least bright pastels. We have a large number of male staff, so we do try to keep it enjoyable for them, too–no baby pastels! Someone in this particular post has very elegant taste, I can see that; perhaps we’ll try such a setting in a few weeks, but using more gold and reds to psychologically warm up the break room. I just want you to know that this post is 100% responsible for my immediate Target trip which resulted in my spending a frillion dollars on Holiday goods. Including that bowl and cake stand. And a fringy garland Christmas tree. And lots of other glitter things. Thanks, Jordan.